Give women a few glasses of white grape juice every day, and a month later their waist circumference will be reduced by a few centimeters, while their HDL will be considerably increased. How is that possible? The Brazilian researchers at the University of Caxias do Sul, who describe the effect in Nutrition, do not know exactly. The researchers got 25 women aged 25-67 to drink 7 milliliters of white grape juice per kilogram of body weight every day for 30 days. That amounts to a few glasses a day. Slightly more than half of the women were overweight or obese. The researchers used a product from the local producer Suvalan, which was made from the American grape variety Vitis labrusca. That is another grape than the European grape Vitis vinifera. Suvalan did not sponsor the survey. This was not a sponsored study. For the sake of convenience, the researchers didn't use a control group. Grape juice contains all kinds of polyphenols, and many of them are derived from gallic acid. The researchers asked themselves whether adding these substances to a diet could make humans healthier. For the record: the women already consumed 1800 milligrams of polyphenols per day. The addition of white grape juice to their diet added a few dozen milligrams. The women were slimmer in their waist almost 2 inches, lost weight - and at the same time their HDL level increased by 16 percent. All those differences were statistically significant. The results of Brazilian research evoke associations with all those studies in which tomato juice has interesting health effects. 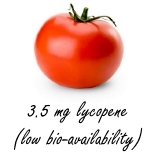 These studies are not always perfect, but good: we know from tomato juice that it is a good source of fascinating substances such as lycopene, tomatidine, 13-oxo-ODA, esculeoside and GABA. 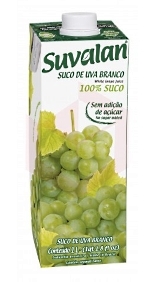 Such substances are, as far as we know, not present in white grape juice in potentially effective amounts. Run again, that Brazilian study? But now with a placebo group? If you drink a large glass of tomato juice every day you'll lose a little weight - without changing your diet and without doing more exercise. If you eat 300g raw tomatoes every day for a month, the concentration of HDL - the 'good cholesterol' - in your blood rises by 14 percent.